Getting into a top-notch graduate school or getting placed at your dream company is one of the best things one would consider in his life. However, for schools, there are a few competitive ones that require potential candidates to send letters of recommendation along with their application and this is maintained as a standard practice. Likewise, landing a dream job, if you have a good amount of experience, requires you to find some seniors to explain the potential to you. Hence, a letter of recommendation has become an important feature that proves your potential to the authorities of your dream schools or dream companies. The Sample Letters could help you get an idea of what should be in your Reference Letter. 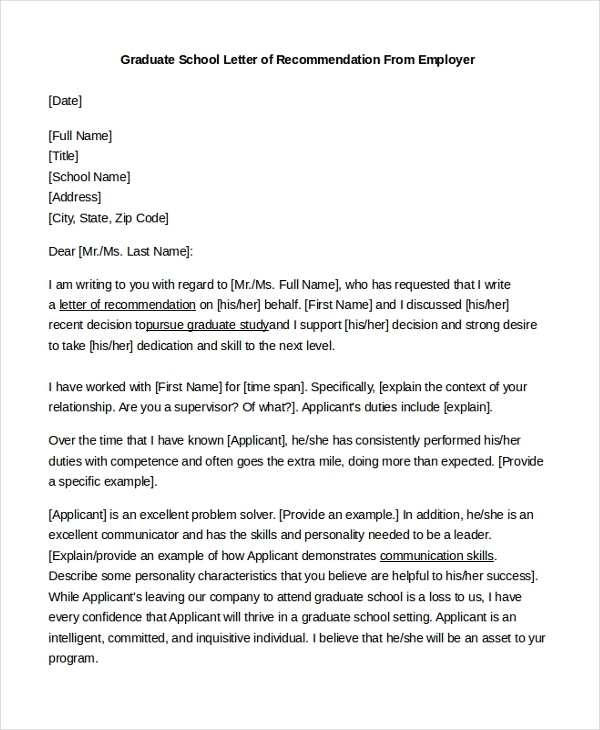 A graduate school letter of recommendation from an employer is given to a person who is currently working and wishes to study further after a period. Usually, the manager or team leader signs up this letter. A student who wishes to go for his master will also get his employer to recommend his scholarship or financial aid on the recommendation letter. But there are a few schools that ask for a scholarship recommendation letter to be filled according to their format. You may also see Recommendation Letter Formats. A recommendation letter is as important as filling the college application form. If your employer can speak to your potential in a recommendation letter, then that is a positive add-on to your application and it will help your process get easier. you may also see College Recommendation Letters. Most people plan on getting an industrial experience first and go for an MBA further, such people definitely need to ask their employer to write on their managerial skills and why the person is eligible for an MBA course. At some point, you would be required to write a Reference Letter for someone or at times, you get your friend, who has a good history to write one for you. Either way, until the nature of the letter, influences the decision then it is perfect. A Reference Letter from your supervisor will include how you had worked during specific projects and your capacity of handling things. It also comprises of your attitude and the crucial factor in your role. 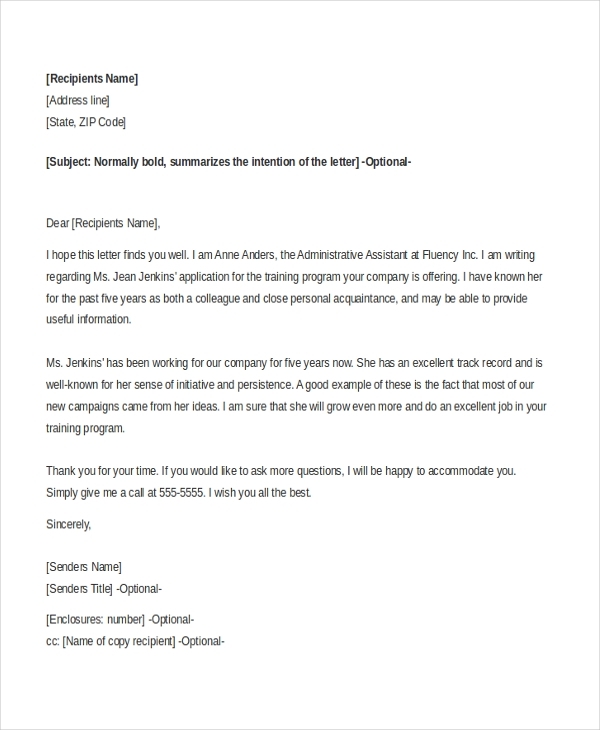 The target audience for these letters of recommendation is students, who wish to pursue their education further and employees who are landing in a different job, usually in a higher posting in bigger companies. 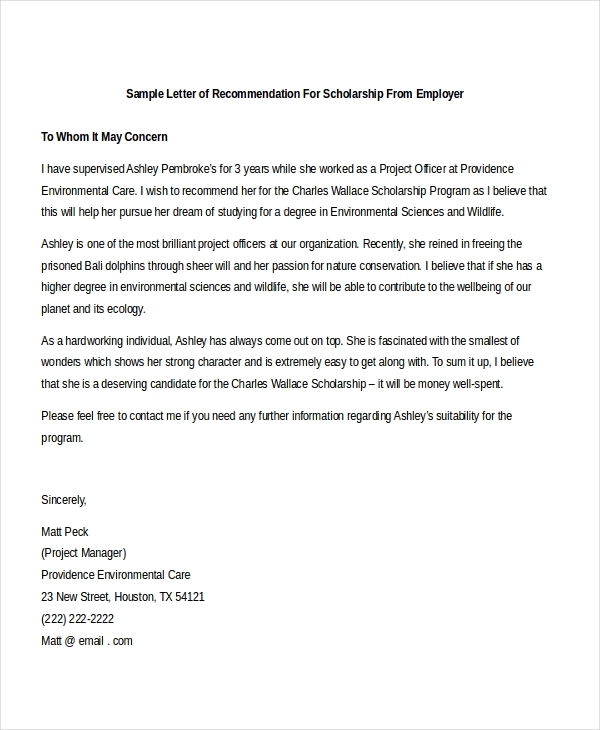 People who seek a Letter of Recommendation for Employment should usually choose a person who can portray their personal and professional qualities with clarity as this is considered as one of your most important documents. This also lets the other employer or the graduate school authorities know about the people who have guided you through or people who have mentored you during your school days and simultaneously, your potential. 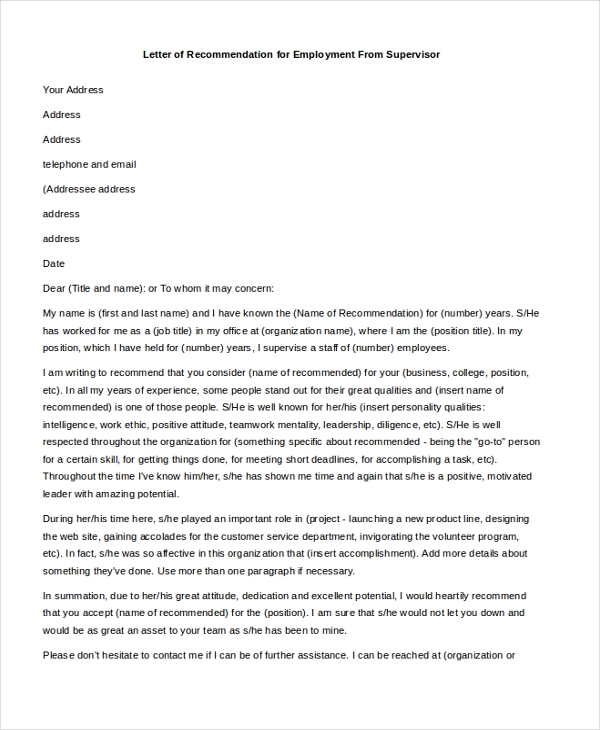 You can also see Example Letters of Recommendation. What are The Benefits of The Employment Recommendation Letters? The major benefit of all that you gain from a letter of recommendation is that you don’t have to explain your capabilities like a fresher does. Before they go for any personal interview, the recommendation letter informs the panel about how you have done the ‘cope up’ thing. In the other case also, the professors would like to see how well your previous mentors, regardless of them being an employer or professor or project guide, speak to your credentials and abilities. 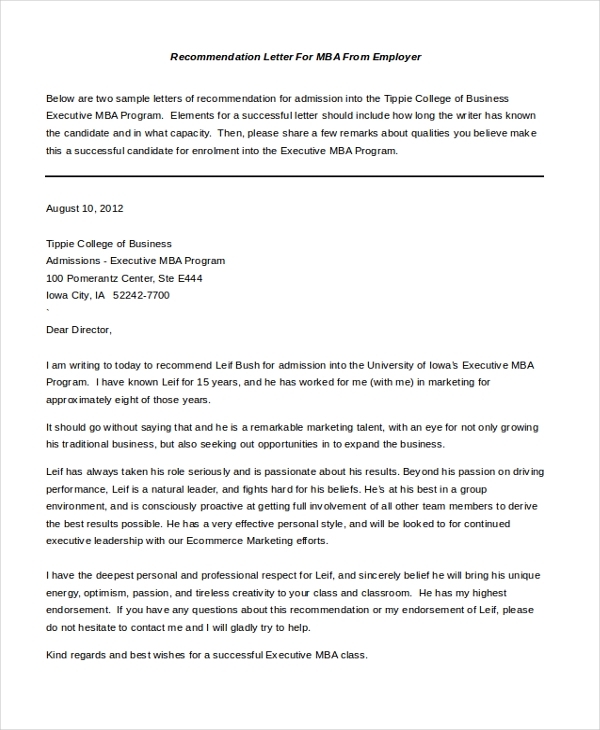 The letter of recommendation builds a way for you even before you enter the college or company. In fact, some universities have a certain template that students can use when writing out one or explain it to your manager, mentor or professor. You may also see Sample Reference Letters. If you wish to strengthen your graduate school application or job application on a serious note, you must consider seeking recommendations from individuals who have a good reputation within the community. Prominent lawyers, published professors, civic leaders, managers and team leaders are also good sources of recommendations as this will speak volumes about you to the people. If your previous employer is a mid-sized one or a start-up or in any way, the CEO was your direct reporting authority, seeking him for a recommendation letter is the best choice you could opt for. You can also see Reference Letter Samples.